Wii U Launch Will Be Big, But Will It Last? 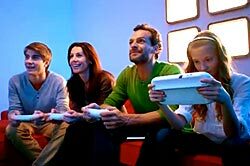 This weekend, Nintendo makes its big bet on the console gaming industry with the introduction of its Wii U system. And while reports indicate that initial sales will be strong (thanks to Nintendo evangelists and the like), the bigger question will be what happens after the initial flurry dies down and long-term goals have to be set. “We believe it's highly likely that retailers will experience some Wii U shortages in the run-up to Christmas. Stock will be replenished in ongoing fashion, but some unlucky shoppers may well miss out," said Piers Harding-Rolls, senior principal analyst, head of games at IHS, in a report. In that same report, however, IHS notes that keeping that sales momentum beyond the introduction period will be a challenge. Because the landscape of gaming distribution and consumption has changed so drastically over the past six years (with many more people playing games on tablets and smartphones), IHS projects that Wii U sales will only reach 70% of the original Wii’s sales in the first four years of its availability. Moving forward, the factors that contributed so heavily to the original Wii’s success will be hard to repeat for the Wii U. While the Wii reached new audiences and achieved breakthrough innovation through its simplified, motion-based gaming controls, some gamers have moved on to more sophisticated systems from Sony and Microsoft, while others may not be convinced of Wii U’s dual-screen promise. To build on initial success, Nintendo will have to ensure that third-party developers are developing a continuous pipeline of high-quality games for the system and will have to continue to engage with consumers through digital channels and updates, according to IHS. With 30 games ready to go at launch (the largest number in the company’s history) and several extra features coming, Nintendo says it understands the need to continually provide reasons for consumers to desire their new console.